I’ve enjoyed so many lovely well-wishes and hugs from friends old and new, far and near, and with each conversation, I try to put it all into words. In case you were one of the ones to ask, and if my answer was feeble…this is for you. I do better in writing at times like this. I think better with my fingers. Who did you tell your news to first? My dad. I did not share with him that I had been going through the genetic screening process, so the first he knew of it was the morning I received my results. He and my step-mom were on vacation in Hawaii, and we had to wait a bit because of the time change. Gabe was with me at the final appointment. Afterwards, we drove into Los Gatos for brunch. It was a beautiful spring day, and while we were on the way there, we texted my dad a photo of my new tattoo and waited. Giggling, we then sent him a photograph of the lab results, and waited. The phone rang less than 30 seconds later, and I was able to cry with him over the phone. If you’ve ever met my dad, you know – crying isn’t something he does very often. It was beautiful to share that moment, fully joyful, fully relieved, fully open to all the emotions that came with it. How does it feel to know you don’t have it/no longer have that hanging over you? Go put on a pair of really dark sunglasses. Wait five minutes. Then, go outside and walk around a bit in the sun. Now, take off the sunglasses. It’s just like that. I’m still squinting at the brightness. I had no idea how dark my world had become with this looming overhead, filtering out the light, warmth, and life. It is shocking how big and wonderful my world now feels. Even now, three weeks later, I still forget that I don’t have to worry anymore. I’ll kiss the boys while they are sleeping, curled into their blankets in a tangle of feet and elbows, and the script still plays, unbidden: You won’t get to do this much longer. And now, a new script cuts in: Oh, yes I will! Since the results were negative, do you regret getting the tattoo? The message – that battle cry – still applies. I have no guarantee against suffering, loss, illness or death. I simply have one less option. I’m just as at risk for cancer as the next girl. And now that the possibility of a long life is actually there, I could easily become completely obsessed and paranoid about the rest of my health. But, life isn’t something we have any control over, and it can’t be held too closely. 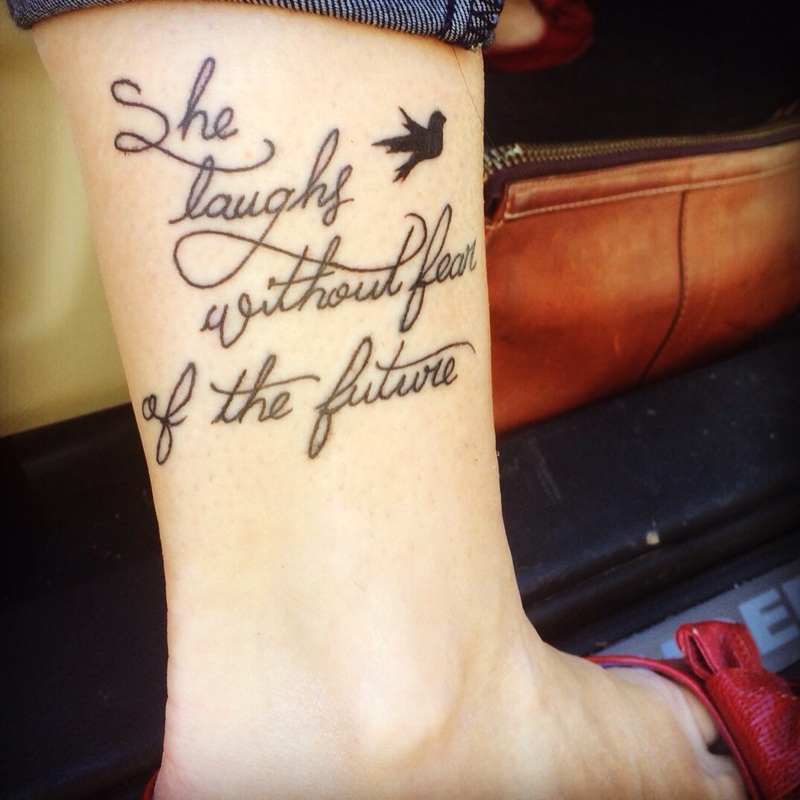 I still choose to laugh without fear of the future. But I might try to be better about eating my greens….and calcium! Longevity runs in my family – my great-grandmother died at 97 and my grandfather is still kicking at 91. I’m shooting for 100. Have you done anything new or different now that you know this isn’t in your future? As my first act of living unhindered, I began taking guitar lessons along with my seven year old. I know nothing. It’s splendid to begin a new skill and think I might master it in five or 10 years, and still be around to enjoy myself. Or play back-up to my little virtuoso. I’m also back to working on a book manuscript. It’s the story of a girl who found herself trapped in darkness after the loss of her mother, and how she came to realize that living in the light is really just allowing the broken bits to show. The cracks are how the light gets through. The light – it was there all along, on the inside. I just didn’t know how the book would end. Now I do. I’m crying a lot – bearing in mind that I was also numbed out on Zoloft for the duration, and I would not have been able to survive that 9 months without an ulcer had I not been. It is nice to feel things again, even though I’m feeling everything rather intensely. The first week I was off the meds, I had a meltdown over not being able to have hamburgers for dinner. My husband is a saint. A saint, I tell you. Thankfully, that intensity has tempered a bit. Even still, little things get me teary. Facebook videos and dogs. Praying with my children, thinking about my mom, listening to the radio…a backwards sort of grieving. I’ve already gone through the other stages of acceptance, anger, and blame. I’m at the beginning now, where all that pain I’ve carried around for decades burbles up to the surface, and I just can’t hold it back. It leaks out, like it or not. What a beautiful story. The book sounds amazing…can’t wait! Beautifully told, Adelle. I cannot imagine.